The success of our surprise attack on Pearl Harbor will prove to be the Waterloo of the war to follow. For this reason the Imperial Navy is massing the cream of its strength in ships and planes to assure success. 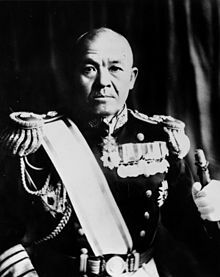 Chuichi Nagumo (25 March 1887 – 6 July 1944) was an admiral in the Imperial Japanese Navy during World War II, overseeing the attack on Pearl Harbor. On July 6, during the last stages of the Battle of Saipan, Nagumo committed suicide; not in the traditional method of seppuku, but rather a pistol to the temple. His remains were later found by American Marines in the cave where he spent his last days as the commander of the Saipan defenders. He was posthumously promoted to admiral. Mr. Chief of Staff [Ryunosuke Kusaka], what do you think? I feel that I've undertaken a heavy responsibility. If I had only been more firm and refused. Now we've left home waters and I'm beginning to wonder if the operation will work. This page was last edited on 1 January 2018, at 21:28.